Pioneers in the industry, we offer full tempered leather punches from India. Ours is a reputed name in the industry that Manufactures and Supplies a wide assembly of Full Tempered Leather Punches. 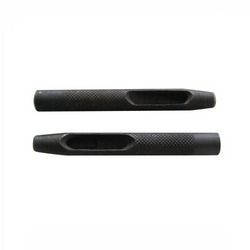 Massively acknowledged in the industry for their tough construction, black oxidized finish for better grip and lightweight, these punches are highly desired in the industry. Full tempered leather punches can be acquired in multiple specifications. Features: Lightweight Compact design Easy to use Specifications: Size: Customized We are mainly looking for North India, North East, West Bangal Queries. Looking for Full Tempered Leather Punches ?